The passport I used to enter today is not normally allowed visa-free travel. However, that did not stop me from arriving without an advance visa. The simple reason is that, for reasons I explained in this video, I maintain a Montenegro residence permit that allows me to come and go. For those of us born in developed countries with excellent travel documents, the idea of not being able to visit any country we want seems ridiculous. Of course, there are exceptions that aren’t talked about, such as US citizens needing a visa to go to Brazil. For the most part, however, most of us are accustomed to just showing up at any given place and being easily allowed past the velvet rope. Those of us who obtain dual citizenship may not be so lucky with our second passports, though. If you plan to travel on a second passport that has lesser travel privileges, you should be well aware of visa restrictions where you are going. However, you should also be considerate of transit visa restrictions in the countries you are stopping by on the way to your destination. While easy to overlook, some countries have strict visa requirements for merely transiting the country. 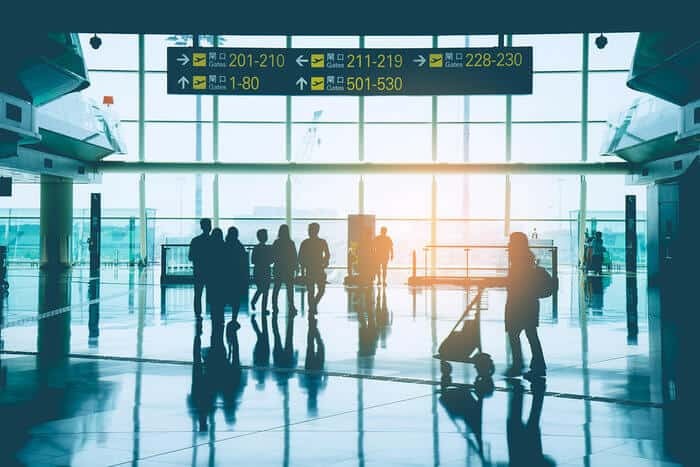 Some countries like the United States require every arrival passenger to have a transit visa or electronic travel authorization before arriving, even if they are continuing their journey to a third country. Other countries offer very relaxed transit visa policies, and will allow citizens who couldn’t visit to travel through. For instance, Qatar wouldn’t be much of a transit hub for the Middle East and Asia if they didn’t allow citizens from those countries an exemption to their tourist and transit visa laws. Instead, countries like Qatar and the UAE have welcomed nationals that other countries frown at, such as Pakistanis, in order to boost their business and their image. I thought it would be interesting to create a list of the major transit countries and their transit visa policies. This will be particularly useful to US citizens who are considering renouncing their citizenship and are concerned about their travel freedom on a lesser passport. A Tier A passport is one which is part of the US Visa Waiver Program. Since the United States is among the most difficult countries to get into, I figure any country with easy access is among the best. Statistically, only about 20% of countries and less than 10% of the world’s population have these privileges. Since the US is the only country to not admit citizens of Bulgaria, Cyprus, Poland, and Romania without a visa, I include these EU countries as Tier A, as well. A Tier B passport is one which is a Schengen Annex II country. In short, this means that Tier B passport holders may visit Europe’s Schengen Area without a visa. Europe is much more lenient than countries like the US and UK, allowing everyone from Colombians to Malaysians to Ukrainians to visit visa-free. A Tier C passport offers visa-free travel to neither the United States or the European Union. 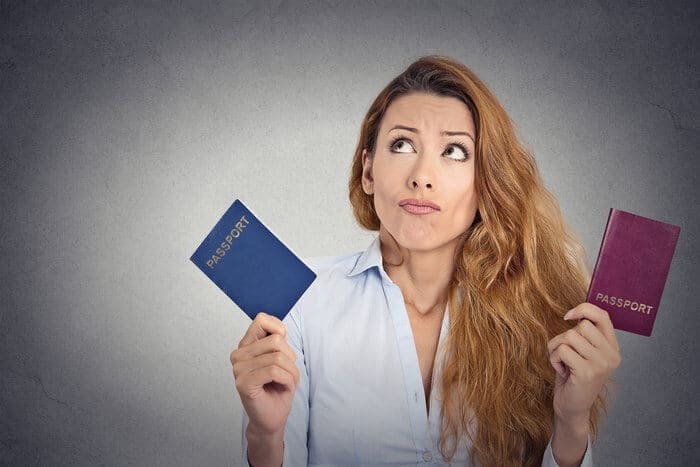 It is highly doubtful that you would seek out one of these as a second passport (except as a back-up second passport), so this category is usually reserved for people who are natural-born citizens. While some countries offer transit visa-f ree policy for all passengers regardless of nationalities, most countries offer greater but not full latitude. For example, an Uruguayan citizen can’t visit Australia without a visa but can transit to a third country without one. Meanwhile, an Indian citizen will require a visa for any reason. Obviously, you should check with the relevant authorities before traveling on this advice. This guide is designed to give you an idea of the level of travel freedom you can enjoy with various second citizenships. One more important note: countries generally allow you to enter or transit on their passport if you have one, so make sure to take this into account if you’re a dual national. For example, US dual citizens must always use their US passport at any US border checkpoint. Australia has one of the world’s most difficult visa policies, but does allow a bit more leniency than the United States for transit visa passengers. Australia’s policy is unique in that it allows some wealthy Gulf countries to transit, but not stay, as well as less affluent Tier C countries such as the Philippines. As such, there is no clear policy, but in general Tier B and Tier C passport holders will need a visa. 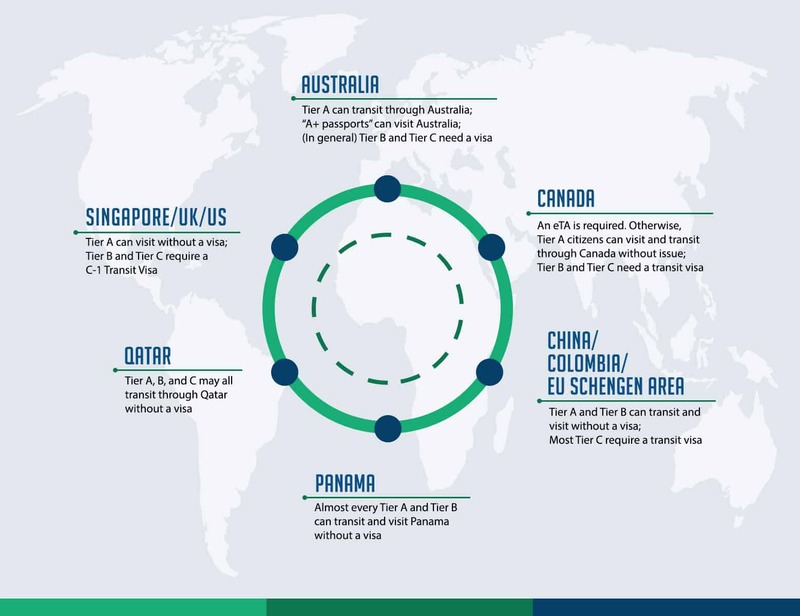 The listed exceptions above are usually due to proximity; for example, Vanuatu citizens would have a hard time going anywhere if not for Australian transit privileges. Those that qualify for a transit visa waiver must arrive by air, have a layover of eight hours or less, and be able to prove they can enter the destination country. 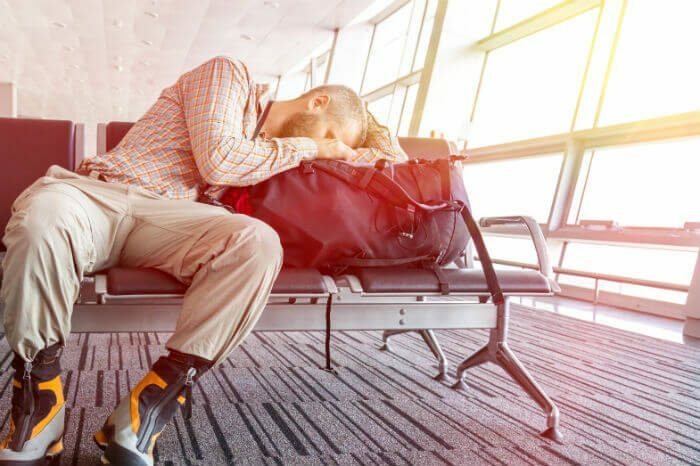 Canada recently copied the United States policy of requiring all visa-exempt visitors and transit passengers to obtain an eTA, or electronic travel authorization. That means you either need a valid visa or an eTA to touch down on Canadian soil; the only exceptions are US citizens. An eTA requires one to answer numerous questions about criminal convictions, health issues, and dual citizenship and costs C$7 to obtain every five years. Otherwise, Tier A citizens can visit and transit through Canada without issue. Tier B and Tier C citizens will follow similar procedures to those in the United States and will need to apply for a transit visa, or a standard visitor visa online. This process is different than the easier eTA process for “pre-approved” nationalities. The only exception is a Visa Waiver program for nationals of Taiwan, Indonesia, Thailand, and the Philippines, but this program involves a lot of nuances including holding a US visa. Basically, don’t plan to fly Air Canada without a visa unless you hold a Tier A passport. Tier A and Tier B passport holders are, by definition, exempt from visa requirements for visiting and hence from transit visa through the Schengen Area. Most other Tier C passports require a transit visa through some airports, meaning careful planning could allow for transit through the European Union. Indian citizens, as the stated example, need visas in all countries except for the Czech Republic, Germany, and France. One issue to remember when transiting the Schengen Area is that intra-Schengen flights require you to go through passport control. That means a flight from Mumbai-Frankfurt-Munich-Mexico City would require a visa for you to enter the Schengen Area. Panama maintains one of the world’s most friendly visa-free regimes, allowing citizens of more than 100 countries to enter without any advance action for up to 180 days at a time. As such, almost every Tier A and Tier B citizen can not only transit but visit Panama without a visa. Practically any passport you could qualify for or that would be worth having can visit Panama. The only exceptions I found were Albania, the Dominican Republic, and the Philippines. Even if your passport doesn’t allow you entry to Panama, holding a residence permit in any of the visa-free countries qualifies, meaning an Indian citizen could obtain residence anywhere from Mexico to Serbia and get in. Even if you still can’t visit the country, Panama does not require transit visas for any international passengers provided they stay in the terminal and their layover does not exceed nine hours. Easy. Qatar Airways is one of the best airlines in the sky, and Doha Airport makes transiting from Europe to Asia – or almost anywhere else – comfortable and easy. You would imagine that such an open place would make transit visas easy, and you would generally be right. Tier A, B, and C passport holders may all transit through Qatar without a visa. Citizens of or recent visitors to Afghanistan or Pakistan may be requested to show a yellow fever certificate. It is possible to obtain a Qatar transit visa which allows you to spend up 96 hours actually visiting Qatar. In that sense, their definition of “transit” falls into that of China, Belarus, and other countries that perceive transit as a stopover rather than an airport layover. Different rules apply for this short-stay visa. The United States has one of the most aggressive visa regimes, requiring all non-US citizen tourists and transit passengers alike to carry either a valid visa or ESTA registration before traveling. The only exception is Canadian citizens, who may arrive without any prior preparation. Tier A passport holders, by definition, can visit the United States without a visa but are required to complete the ESTA pre-clearance application online; this is done once every two years, not once per trip, and the fee is $14. Tier B and Tier C passport holders, also by the definitions above, will require a C-1 Transit Visa. However, the requirements for a C-1 visa are just as difficult as for a B-1/B-2 tourist visa; in fact, I think a B-1 visa could be easier. As such, anyone other than US citizens, Canadian citizens, and ESTA eligible citizens will need some type of visa that requires an embassy interview. Excellent article but I think some of your classification is flawed. How are Malaysia and Colombia in the same ‘Tier”? Malaysia’s Visa Ranking according to the Henley, other Indexes is Number 4 or 5 while Colombia’s is Number 39 or 40. Yes, Malaysia is not entitled to visit the US visa free, but that does not make a Rank 5 country and Rank 40 country the same Tier.